﻿ 7 Free Resources to Get Better Email Marketing Results » Red Mango Marketing! If you work for a small business, “marketer” is just one of the many hats you wear on a daily basis. You’re busy. And it’s tough to keep up with the latest marketing tips, tools, and best practices. Where can you go when you need marketing help or advice? 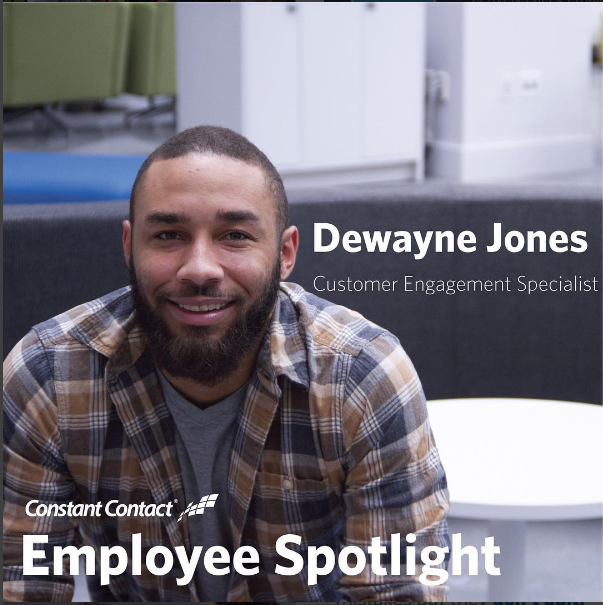 At Constant Contact, we have multiple teams dedicated to providing quality education and support to help you be a better marketer. Whether you like to learn through online tutorials, live in-person trainings, or by picking up the phone and talking to a real person — we want you to have an easy way to get your questions answered. Have a question about adding images to your email? Call us. Not sure how to make your email mobile responsive? Call us. Our award-winning support team — recently recognized with a Bronze Stevie® Award — is here to help. With 25,000 customer calls, chats, and emails on an average week, we know our customers want to talk to real people when they have a question. Our trained specialists will help get you back on track and offer the advice you need to get great results. You can contact our phone support directly Monday – Friday and our social support on the weekends. Do you learn best through in-person trainings? Our seminars and trainings offer expert advice on everything from getting started with email marketing, mastering social media, and getting the best results. These events are open to the public, no Constant Contact account required. See our full event listings to find the right topic and location for you. From creating email campaigns, adding contacts, and growing your email list, our product tutorials will walk you through the process, step-by-step. Looking for general marketing advice? Our YouTube channel is full of email marketing tips, best practice videos, and ideas to market your business on a shoestring budget. 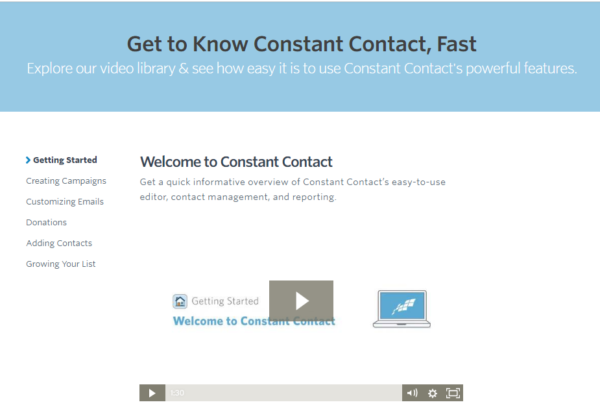 Want a quick summary of how to use a Constant Contact tool or feature? Our regularly updated Knowledge Base has how-to articles and guides to get you quick answers. Search by topic or keyword to find the article you need. You’ll find everything from Average Industry Open Rates to suggestions for the Best Time to Send an Email. Looking to connect with an active community of like-minded small business owners? 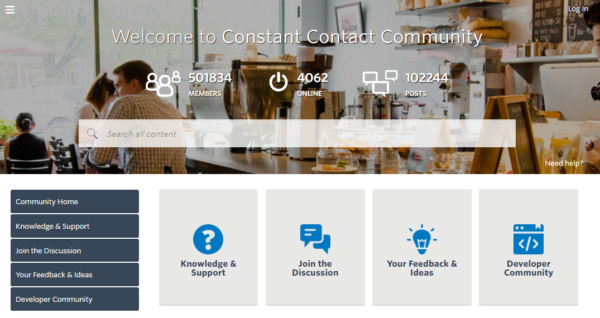 The Constant Contact Community is the perfect place for businesses to come together and share ideas. Join discussion forums, give feedback and ideas, and get practical advice from Constant Contact customers and employees alike. 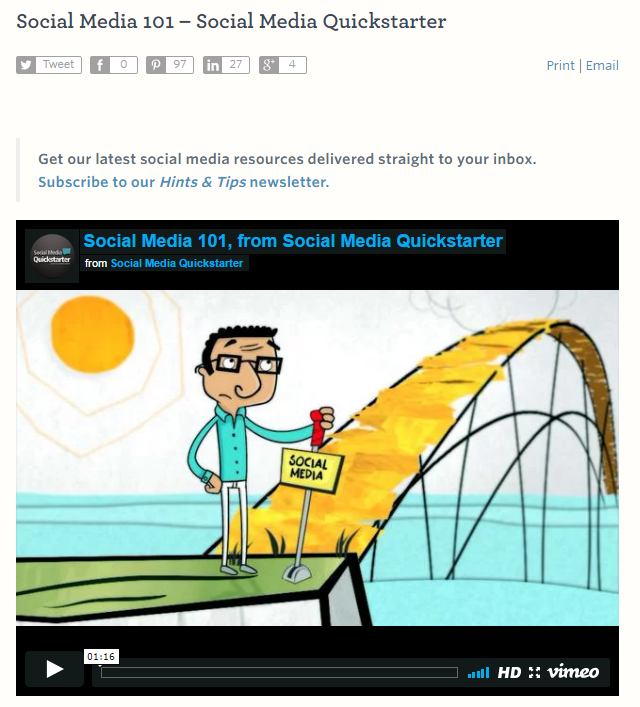 Get our best marketing resources — delivered straight to your inbox! Our Hints & Tips newsletter provides a roundup of our latest blog posts, webinars, and helpful how-to guides so you can take your marketing to the next level. By signing up, you’ll join over 130,000 other businesses that receive our newsletter on the second and fourth Wednesdays of every month. If you’re feeling extra ambitious, you can subscribe to our Marketing Blog and receive almost-daily updates each time we publish a new blog post. You know social media is an important channel to connect with your customers and supporters online. But how can you get started? Our Social Media Quickstarter helps you get set up on major networks including: Facebook, Twitter, LinkedIn, Pinterest, Instagram, YouTube, and Snapchat. Recognized as a top online course for marketers by sites like Inc., Mashable, and USA Today — the Social Media Quickstarter provides advice on setting up each channel, growing an audience, and measuring your results. No matter what marketing challenge you’re facing, we’re here to help through it. Looking for something specific? Leave us a comment and let us know! We’ll point you in the right direction. 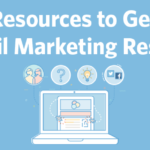 The post 7 Free Resources to Get Better Email Marketing Results appeared first on Constant Contact Blogs. This entry was posted on Friday, May 5th, 2017 at 9:30 am	and is filed under Email Marketing, News & Updates. You can follow any responses to this entry through the RSS 2.0 feed. Both comments and pings are currently closed.